At The Tennergy Solution, we back our experience and knowledge with the best personnel in the business who receives extensive in-house training and education from affiliated manufacturers. The result is a level of customer service that is rare in the insulation industry. Whether you're in the market for a new, high-performance insulation system for your home or business, home inspection, restoration or insulation repair, you can trust The Tennergy Solution. We take our business, our customers and the trust you place in us very seriously. Quality insulation begins with thorough planning by trained insulation professionals. It's "the art and science of insulation," combining performance considerations and aesthetic qualities with in-depth knowledge of key insulation elements. We help create healthier more energy efficient homes through spray foam insulation. Land preservation/conservation (200 acres). 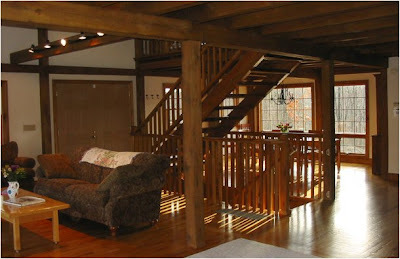 Over 90% of wood used in both units was timbered locally by the local Amish. All natural/biodegradable cleaning, laundry supplies. Recycled toilet paper, coffee filters, garbage bags. Recycling required by guests. The following items may be recycled: paper, cardboard, plastics, all glass, tin, aluminum. All natural lawn and pesticide care. 100% recycled paper is used for business correspondence and brochures. Brochures are printed with soy ink. We carbon offset both units through Native Energy. We use a Green Credit Card and Green Cell Phone. We are a Certified Wildlife Habitat and Monarch Watch Waystation. Proud members of Co-Op America, TIES (The International Tourism Association) and The Green Hotels Association. The owner, Gwen, has been working with environmental education over the past 20 years. She is helping her local tourism association create a Green Certification Process. Additionally, she writes a weekly Green Tip for the Logan Daily News and the Athens Messenger, two local newspapers.